According to old yogic scriptures everything in this Universe consists of vibration, matter is condensed vibration.The element that gives space to matter to exist is the most subtle of the five elements, the element ether. From ether vibration materializes to the most dense element earth, matter. In our human bodies the vibration of sound is being produced in the throat, the location of our fifth energy centre. The sense of hearing, the vibration of sound and the element of ether are associated with the throat chakra and therefore it is not surprising that through what we say (and think) we can manifest and create. When you have a true understanding about the manifestational and creating power of your words you will be more aware of what you say, your words are consciously chosen. Yogi Bhajan said that the most important power of a person is the spoken word, both what you speak and how you speak, because it is through the utterance of words creation starts. Also he stated that one of the first signs of the awakening of the kundalini is a new awareness of the power of our words. This awareness is also indicating a well functioning throat chakra, there is a clear differentiation between truth and untruth. Speaking the truth strengthens your throat centre. Lying, negative or destructive speech depletes the energy of this chakra. A form of lying that is especially harmful is making destructive statements about yourself. Unfortunately this is very common amongst human beings. We tell ourselves paralyzing lies like ‘I will never get it right’ or ‘I can’t do it’ or probably the most frequently used ‘I am not good enough’. These self-destructive statements do not only affect the power of your psyche but also directly diminish the energy of the fifth chakra, where we utter these negatively charged vibrations. The Sanskrit name for the fifth chakra located in our throat is Vishuddha which could be translated into “purification”. Shuddhi, which means “pure,” and the syllable vi intensifies the word, hence one could also say the translation is “especially pure.” Since this is the first of the three spiritual chakras located in the upper part of the body classical yogic teachings point out that the physical body and the mind need to have reached a purified state for this chakra to be in balance and fully opened. A sincere yoga & meditation practice will certainly contribute to this if one is willing to honestly look at oneselves and transcend negative behaviour, patterns and habits and heal and let go of (emotional) wounds from the past. Once this chakra is in its full glory we are able to express ourselves with total purity and honesty. A lot of physical exercises in Kundalini Yoga are energetically work on the throat centre since it correlates to our jaw, mouth, tongue, trachea, cervical vertebrae, thyroid, parathyroid, neck, shoulders and brain stem. When we experience discomforts in these areas this could indicate that our fifth chakra deserves some extra attention. Many Kriyas contain shoulder and arm movements, head turns, neck rolls and pranayamas to open up the throat and help us liberate and thus purify stored & blocked energy, emotions and frustrations. 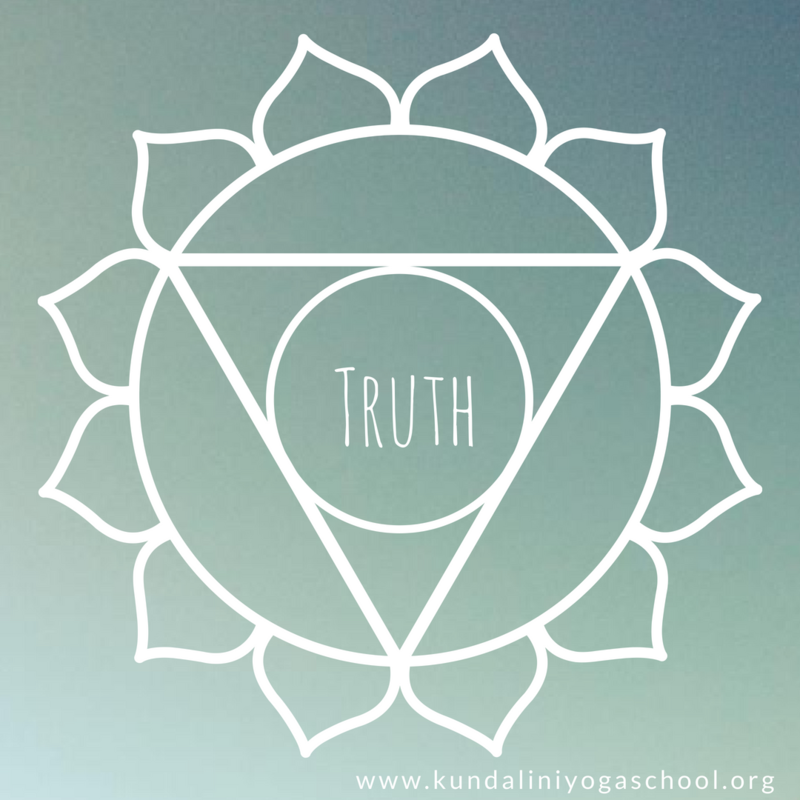 Through a committed practice of Kundalini Yoga you will be able to transform and grow allowing you to move towards the realm of the higher energy centres where everything becomes way more subtle. Once you can start to perceive things from a higher perspective and start to take it less personal (which happens in the first three chakras) you can gain more understanding and you start to see clearly how life is providing you with exactly what you need. Besides breath and movement in Kundalini Yoga we very frequently use mantra and sound to clear, activate and heal our throat centre and corresponding themes like speaking, listening, self expression, reaching a higher more subtle form of communication. Chanting can help us to overcome shyness and encourage a healthy form of self expression, allowing our words to be uplifting and inspiring. Instead of speaking bluntly we can move towards a more harmonious way of communicating. In the Online Guided Sadhana ‘The Power of the Word’ we we are deeply looking into the power of words and become aware of how we create our lives through what we say. Words are like seeds you plant in the present moment that will eventually become your future. Is what you say truly what you want to put out there? We offer you the chance to discover, reflect, understand and grow your awareness with our daily guidance for 22 days and Kundalini Yoga.